This is the heart of the movie. A simple sentence, no? It's something that we as adults struggle with every day. Anything that helps instill that in our kids now is a good thing, in my opinion. Alexandria and I attended the "Barbie™ A Fashion Fairytale" Pink Carpet Premiere that was offered by the Yummy Mummy Club. Check her out working that pink carpet and the paparazzi! This movie is set 'in the real world' as Barbie is an actress and even refers to some of her other 'movies'. A fun touch. 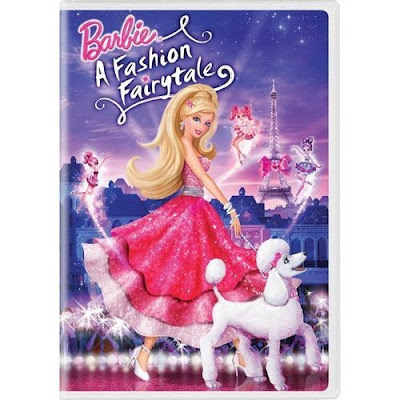 She travels to Paris to spend some time with her Aunt Millicent at her fashion house after Barbie thinks she's been dumped by Ken - over the PHONE, no less! We've just recently gotten into the Barbie movies and I would say Barbie has evolved as an icon. She's not all about outer beauty and a look to aspire to. Even though this movie is about fashion, it's really about believing in yourself and being true to who you are. Alex and I both enjoyed this movie. I thought the fashion show went on a little long, but when I asked Alex what her favourite part was, she said the fashion show... so, what do I know? And I would LOVE a glitterized carriage with a flat screen. Now THAT's a way to travel. One thing I would like to see is Barbie and her friends with a *bit* bigger waists! Her body (albeit computer animated) is quite impossible to live up to! 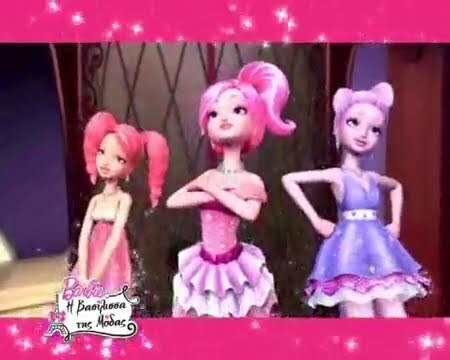 So, Barbie: A Fashion Fairytale gets two thumbs up from Mommy and two enthusiastic thumbs up from Baby Girl!